Images can be stored electronically and emailed to your specialists and insurance companies. Our office use low radiation digital x-ray technology to capture clearer images your teeth that Dr. Zheng can view right away. The images can also been immediately shown to you using TV monitor mounted on the ceiling. Digital x-rays allow Dr. Zheng to see areas of your mouth and teeth that would otherwise not be visible: cavities between the teeth, infections in the roots, odd angles, etc. Problems can be detected and treated earlier before you may be aware of them. If decay and infection go undetected and untreated, they can lead to pain and discomfort as well as more costly and invasive dental treatment. If you have questions about why x-rays are needed and how often you should have them done, please talk to Dr. Zheng. Your dental care does not end after your visit. We encourage you to take the steps to maintain your oral hygiene by brushing and flossing regularly. Brushing is best paired with flossing. While brushing takes care of the larger food particles and most of the bacteria in your mouth, flossing helps you reach in between teeth and the gum line as well. Flossing helps clean 35% more of the tooth surface than just brushing, so we recommend that you floss daily. Plaque ----- a film a bacteria that sticks to your teeth can build up to cause gum irritation, cavities, gingivitis (inflammation of the gums) and progress to cause periodontal disease and even tooth loss. Gingivitis ----- a swelling and inflammation of the gums, is the first stage of periodontal disease. Periodontal disease ----- Periodontal disease is an ongoing, degenerative infection of the teeth, gums and surrounding bone. It is caused by plaque that has been left in your mouth that has hardened into tartar. The tartar increases harmful bacteria in your mouth causing your immune system to respond by releasing enzymes. These enzymes, however, destroy the bone around your teeth. The weakened bone causes your teeth to loosen. Research in periodontal disease has shown that there is mounting evidence of periodontal health impacting one’s overall health because your mouth connects to your digestive system and your bloodstream. A dental infection like periodontal disease increases the risk of heart disease, stroke, heart attacks, and high cholesterol. Your oral health can affect your overall health. Use an electric tooth brush if fine movements are difficult. The ideal time to first see a dentist is when your child's first teeth come in at around 6-12 months. Dental problems start early and it is important to safeguard against problems that can affect the development of your child's mouth such as baby bottle tooth decay, gum disease, teeth irritation, prolonged thumb-sucking, etc. It is encouraged that you talk to a dentist to learn about what the visit will entail and communicate this to your child so there are no surprises. While cavity prevention starts with a healthy diet, brushing twice a day, daily flossing, and regular dental checkups, sealants can offer additional protection against tooth decay. Sealants are thin, plastic coatings painted on the chewing surfaces of the back teeth (premolars and molars). This clear, plastic coating bonds into the depressions and grooves (pits and fissures) of the chewing surface effectively sealing out the decay-causing bacteria, and reducing the risk of cavities and tooth decay. Children and teenagers will benefit the most. Strong teeth need a variety of foods from each of the basic food group including whole grain breads and cereals, fruits and vegetables, lean meats or alternatives, and dairy products. Essential vitamins and minerals in particular, calcium and phosphorus, and vitamin D are needed for strong teeth and bones, as well as vitamins A and C for healthy gums. While everybody knows that eating sweets is bad for your teeth, what you may not know is that the amount of sweet food you eat is not as important as the length of time your teeth exposed to sweets. This means that you should avoid eating sticky sweets like toffee or hard candies like mints, because they stay in your mouth longer. It also means that eating sweet snacks between meals is much worse than with a meal because at mealtime, the increased flow of saliva helps protect your teeth by washing sugars away. Choose something without sugar nuts and seeds, peanut butter, cheese, plain yogurt, or popcorn for your between meal-snacks and save your sweets for mealtimes. We're very proud to offer you CEREC 3DTM, the latest generation of CEREC 3DTM, the world's most advanced dental restoration system. CEREC 3DTM (Ceramic REConstruction) allows us to manufacture lifelike porcelain crowns, veneer, inlays, and filling right in our office. Previously these types of tooth restorations required at least two appointments. 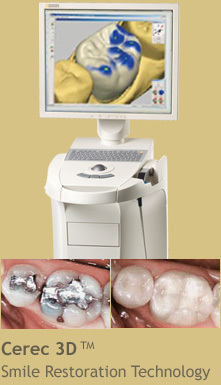 CEREC 3DTM uses Computer Aided Design/Computer Aided Manufacturing (CAD/CAM) technology that allows us to obtain a full 360°perspective of your mouth, take an accurate three dimensional picture of the damaged tooth, then transfer it to a color computer screen. No need to take impressions moulds! The 3D CAD/CAM program images are very realistic and allow Dr. Zheng to design a piece perfectly fitted to the natural tooth and surrounding teeth. Together with the CAM program, CEREC 3DTM technology allows us to precisely mill the restoration so we can bond it to your teeth with a perfect fit. We use strong ceramic material that is matched to your tooth colour, is translucent like natural enamel and biocompatible. It's also unaffected by heat and cold so you can enjoy hot and cold foods without sensitivity.